The Third Battle of Nola was fought in 214 BC between Hannibal and a Roman army led by Marcus Claudius Marcellus. It was Hannibal's third attempt to take the town of Nola. Once again, Marcellus successfully prevented the town's capture. Upon Hannibal's descent from the alps he had for 3 years won an impressive string of victories against Rome The battle of Ticinus, Trebia, Trasimene and Cannae were some of the more notable victories that he'd won These had been disastrous defeats for the Romans, especially the latter battle. This victory brought the Romans to the brink of despair. The Senate had issued a decree that forbade anyone to say the word, "Peace" within the city itself. Mourning was legislatively circumscribed to 30 days, women were not permitted to cry in the public venues. In spite of these and other like measures, there was much despair in the city and there were a number of young Romans of high birth who proposed desertion to all in the army and to establish a new colony elsewhere. This proposed defection was put down and all thoughts of surrender were circumscribed. However, in spite of the tremendous blow to the cause of Rome, Hannibal could not take the city itself - he did not think he had the resources that a siege of the city itself would have required- and as a result did not attempt it. There were two reasons that Hannibal thought this was the proper course; he did not believe that he had the resources necessary for a siege of Rome itself, secondly thus far - and even after the battle of Cannea he had not been able to break up the Roman Symmachy. Not a single member of the Italian Confederacy ever broke its treaty with Rome, the roots of Roman power in the peninsula were sown deep, based upon time and the mutual benefit that both Rome and her subordinate allies had received from the alliance. To be sure, there were colonies that had been detached from the Confederacy in Cisalpine Gaul, but no seriously demoralizing blow had been struck at the Symmachy. So after Cannae, Hannibal set about just this task. It was indeed upon the basis of his being able to detach the confederates of Rome, that Hannibal had calculated upon a lasting victory. Without them, nothing serious could be brought about. So after the battle itself, Hannibal started to conduct diplomacy to this effect. Phillip of Macedon promised a navy and an army to descend on Italy - it was in this way that he hoped to simultaneously strike a blow at Rome herself while regaining Epirus to his kingdom. In addition to this, Hiero II of Syracuse recently passed, and his successor concluded a treaty with Hannibal. With the end of detaching more confederates from the Roman Symmachy, after the battle Hannibal released all soldiers that had been enlisted under the banners as a result of their cities treaty with Rome without request for ransom. However, in spite of the seeming ascendancy of Hannibal over Rome, his cause was in reality anything but that. His military chest was stretched to its limit, and to this effect he sent a deputation to Rome that requested money in return for hostages. This deputation was forbidden to even enter the city, and the Senate forbid anyone from purchasing hostages from the Carthaginians on an individual basis - deeming the enrichment of Hannibal through the wealth of Rome and its citizens to be unacceptable. What happened at this point, was a number of Roman Allies - although no Latin confederate - were detached. 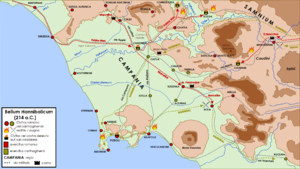 Capua, the second city of all Italy and in a commanding position on the crucial plain of Campania was detached. This city had been much oppressed by the Romans, and faced discriminatory treatment by the Senate and the chief magistrates of the Republic. This city was said to be able to furnish Hannibal with 30,000 foot and 4,000 cavalry. This was a major blow to the Symmachy, and was in and of itself as demoralizing as the defeat at Cannae had been. Following the example of Capua was; Uxuntum, much of Bruttia, much of Lucaria, the Picentes of Salernia, the Harpini, almost all of Samnium Amongst whom the Samnites were noted for their prowess in battle, even still. Hannibal had effectively won over all of southern Italy. From the mouth of the Vulturnus river to the peninsula of Mons Garganus and south nothing could be found except a string of Roman forts holding out and adherents of Hannibal. Dodge, Theodore (1994). Hannibal. Mechanicsburg, PA: Greenhill Books. ISBN 9781853671791. Reprint of 1891 work. This page was last edited on 10 November 2018, at 17:38 (UTC).